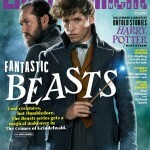 ‘Fantastic Beasts’ & ‘Harry Potter’ Photos, Interviews & Rare J.K. Rowling Chat in New Entertainment Weekly Issue! Fantastic Beasts Movie, Interviews, J.K. Rowling, JKR Interviews, Movies, News, Warner Bros.
Entertainment Weekly reveal the ‘untold stories of Harry Potter‘ with some never-before-seen photos and interviews, including a rare interview with J.K. Rowling, in a new issue! 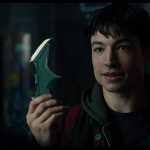 There’s still over a month to go until we find out what he’s talking about – could it be another connection to Potter? A death? 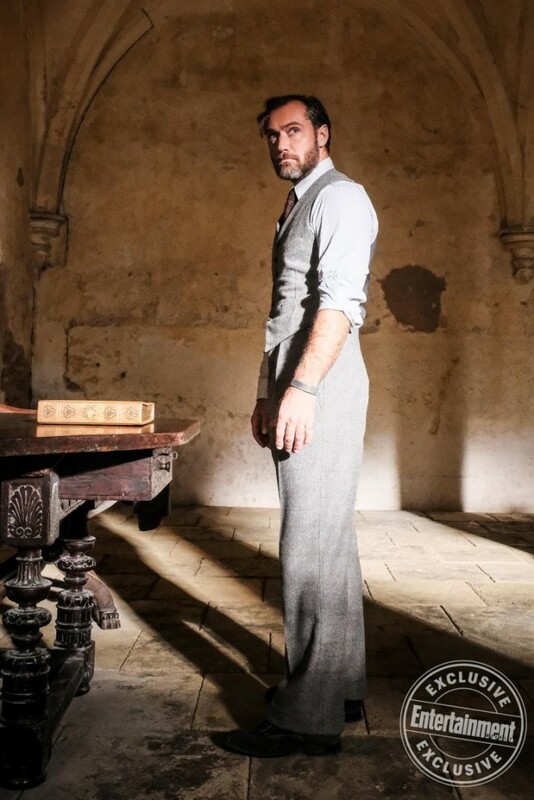 A new revelation about Grindelwald or Credence? A betrayal? Time will tell! 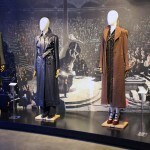 The issue also contains ten exclusive high-quality images, from images we’ve seen before, with official confirmation of their context, thanks to Entertainment Weekly: Newt with a news clipping announcing Tina’s reinstatement as Auror in his basement refuge for magical creatures, Credence and Nagini atop a Parisian rooftop, Grindelwald at his rally beneath the Lestrange Mausoleum, Newt and Theseus at Pere Lachaise Cemetery prepared for battle, Jacob in Newt’s basement (apparently that’s a Leucrotta behind him, and an Augurey), and Newt and Tina exploring the French Ministry of Magic Records Room. An image shared by Alison Sudol is captioned “Tina’s mind-reading sister Queenie Goldstein (Alison Sudol) has a mysterious purpose in Paris”… What the Chocolate Frog – thanks to Ezra Miller for that saying – is Queenie doing?! Leta Lestrange back at Hogwarts (so that WAS her in the corridor in the trailer!) revisiting her desk, which shows the inscription “L+N”, suggesting their close friendship – a tad awkward now that she’s engaged to Newt’s brother! 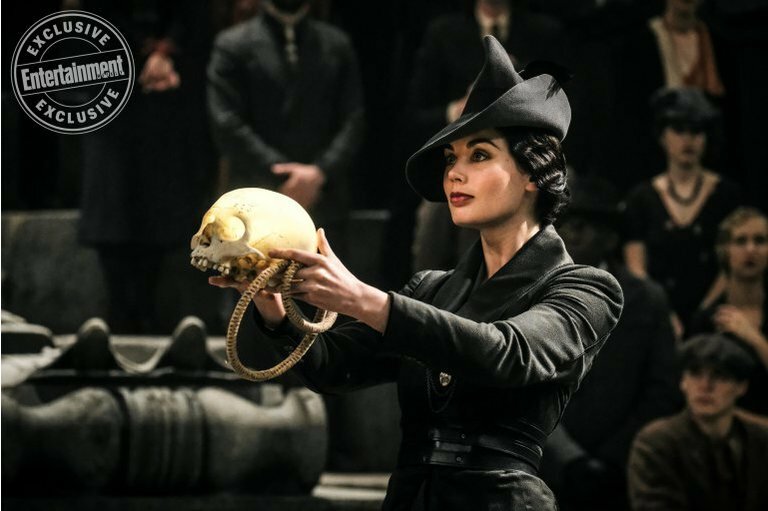 Finally, we see Vinda Rosier holding the glowing skull from the trailer, with a pipe coming out of the end of it. It appears Grindelwald will use this skull at his rally, possibly leading to the blue flame. The wizards in the background certainly look concerned! See all the new images here. The new issue also includes an interview with Johnny Depp (Gellert Grindelwald), giving exclusive information about Depp’s influence on Grindelwald’s look (Colleen Atwood discussed this further in our set visit interview), Grindelwald and Dumbledore’s relationship, and his response to Potter fans concerned about his role in the film after allegations of domestic abuse by actress and ex-wife Amber Heard. What are your thoughts on the Depp interview? How about Grindelwald’s jealousy of Newt? Were you expecting as much? Are you excited to see Leta return to Hogwarts? The full physical copy will be available tomorrow!